This dish reminds me of Savitha Rani, my best friend in junior high school. I owe her the experience of the most macabre ghost stories; an introduction to the idea that dark (and fat) can be beautiful; knowledge of the difference between Iyers and Iyengars and a taster to the world of South Indian cuisine. S’s home was a veritable “Gokul”. Their cold larder, bursting with large porcelain “bharnis” full of ghee, buttermilk, creamy yoghurt and khoya made with the bucket full of milk that Gauri their Holstein/Jersey cow used to give, was reminiscent of little Krishna’s home. It was incredible in the first place that a city dwelling family had a cow. But it was even more remarkable that the family didn’t sell the milk, just gave some away to kids in a neighbouring juggi-zhopri. Gauri’s calf got to drink her fill. The family of four and their dog used up the rest. I will write more about the dairy delights later. Something about a snake gourd kootu S’s amma used to make was very familiar, hence more endearing. It was the coconut and cumin combination – jeera-khobra in Marathi parlance, which reminded me of the padwal with moong dal bhaji Aai makes. 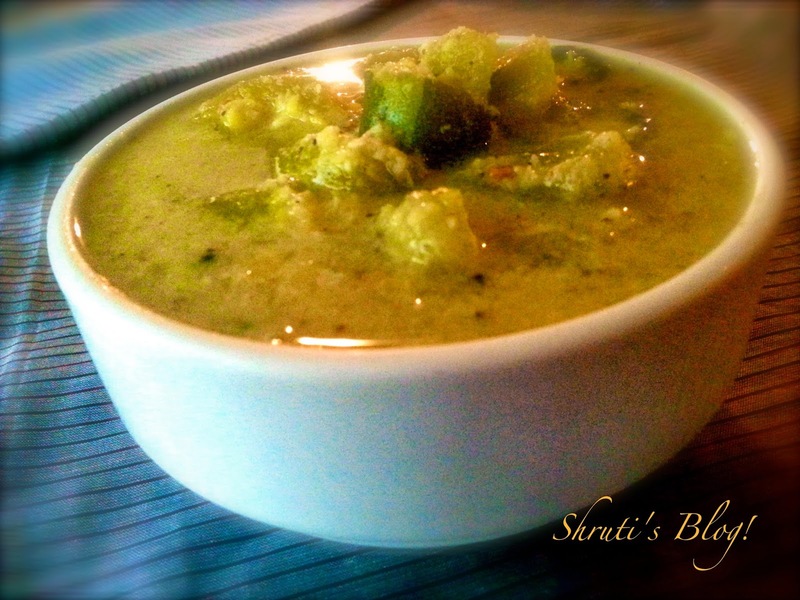 The jeera-khobra was the soul of this bhaji, as it is of the snake gourd kootu. Recently, when I had access to fresh snake gourds after a hiatus, my list of things to cook would have been incomplete without notching a snake gourd kootu. The photo is disappointing though - I was too overcome with the kootu to take a proper picture! Cook the moong and chana dal in the pressure cooker. Boil about 2 cups water in a pan and add the snake gourd pieces, shallots, green chillies, salt, turmeric and cook till the snake gourd is almost cooked – shouldn’t take more than 5-7 minutes. In the mean time, heat a saucepan and add the cumin seeds, pepper corns and toast lightly. Then add the grated coconut and toast lightly. Allow the mixture to cool and then add a little water and grind it into a coarse paste in a mixer/blender. Add the cooked daals and the coconut mixture to the boiled snake gourd, onion and chillies and mix it well. Cook it on low heat for a few minutes, till it all comes together. Adjust the consistency, according to your taste. Heat oil in a pan and add the urad dal. When it begins to change colour, add the mustard seeds and cumin seeds. By the time the seeds crackle, the dal should have turned golden brown. Then add the coconut oil (if using) the red chillies, hing and curry leaves and ghee and pour the tempering onto the kootu and mix well. Serve hot with chapati, pooris or rice with a side of appalams or poppadoms.